Our backyard courts are commercial and residential backyard multi game courts that can be used for tennis, paddle tennis, shuffleboard, inline hockey, as backyard basketball courts, and more. Construction and installation of our custom outdoor basketball hoops and multi-purpose outdoor courts usually only take a day and half, meaning your games can begin in no time. Our modular surfaces are built for durability player comfort, minimal maintenance and optimum performance. Construction and installation of our outdoor basketball hoops and multi-game courts are done within days, so let the family fun begin! Backyard basketball courts from Southwest Greens provide endless hours of fun, as do all of our multi-purpose outdoor courts. In addition to outdoor basketball hoops, we offer residential backyard courts for everything from tennis to volleyball to inline skating. Best of all, construction of our backyard multi game courts can be completed in a matter of days. 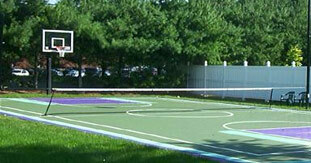 Our backyard courts include outdoor basketball hoops and much, much more. Learn the many great games our outdoor courts can bring into your home, and make a backyard basketball court or multi purpose court from Southwest Greens your next order of business on the home front.